One more layout for some more challenges! I really love them!! I used white cardstock as my background and painted some light blue nuvo embellishment mousse and dark blue acrylic paint onto it. For the top and the bottom of the layout I used stripes of different blue papers and machine stitched over it. The clouds are cutfiles from the cut shoppe. What a fantastic layout. Love the details and stash use. 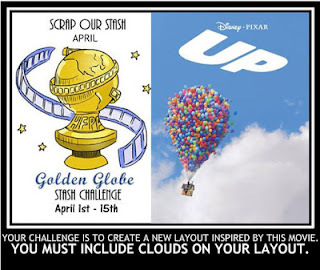 Thanks for joining us at Scrap Our Stash Blog Challenge. Happy Scrapping! What an amazing job with the sketch! Thanks for joining us at Sketch N Scrap! This is gorgeous, Denise! I always love to see your beautiful work! Thanks so much for playing along with us at Sketch N Scrap! Amazing layout! Love all details. Thanks for joining us at Sketch N Scrap. Just beautiful!! Thanks for playing along with us at Scrap Our Stash! The background - amazing. The torn paper - inspiring. The machine stitching - over the top! Love it!!! Thank you for entering your creation at Sketch N Scrap. 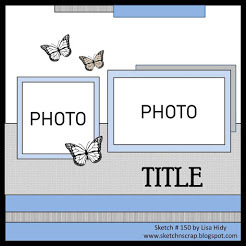 Very pretty layout, love the cutfile.Great idea with the paper strips and stitching :) Thanks for joining in the fun with us at Scrap Our Stash! Gorgeous - love your distressing and mixed media background!! Thanks for joining us at Sketch N Scrap. Great take on the challenge. Love the background and all the blue tones. Thanks for joining us at Scrap Our Stash. Oh lovely! This is a great layout. Thanks for playing along with us at SOS!